Starting a new thread might be a good idea. Perhaps on a somewhat broader context about how immigration is being felt around the world. I did not interpret that as a screed or offensive. It may or may not be accurate, I’ve no way of knowing. dohboi wrote: EU, the last part of your screed was wildly off topic and quite offensive. If you feel some overwhelming need to talk about sexual assault, for some reason, please open your own thread on it somewhere, but keep it out of GW threads please. Thanks. Hmm... migration of barbarians into Europe is largerly GW related (at least IMO) but the topic is interesting enough in itself. Don't know, maybe another thread like "Self annihilation of liberal West by embracement of barbarism" is due. Very nice doom related subject for sure. And (to get back on topic) if you think that a few people of a culture or color you don't like moving into your neighborhood is your biggest concern, you haven't been paying much attention (or have been spending a lot of energy denying reality). ...•Hundreds of millions of lives are at stake... should the world warm more than 1.5 degrees Celsius, which it will do as soon as 2040, if current trends continue. •the interplay between drought and flooding and temperature would mean that the world’s food supply would become dramatically less secure. The only thing that changed, this week, is that the scientists, finally, have hit the panic button. The 'plan' seems to be (and really always has been since the beginning of industrial society) to save the 'economy' by obliterating the planet. Of course, the global economy will also explode anyway, and probably sooner rather than later, as it already nearly did in '08. We will learn too late (if anyone is around to think about it) that slash-and-burn economies don't work so well on a global scale when there aren't other handy, habitable globes around to migrate to (in spite of KJ's dreamy optimism on that subject). Like you said, new topic. Ibon wrote: First it's 3 miles inland. We had it on the market, decided not to sell in the end. We paid $ 500k for both houses in 2009 at the bottom of the market and last year we grossed $ 130k rental. Since I refuse to buy stocks and play the market I need to find a better return doing something else with that asset before I would sell and the sheeples are still happily in denial.... so no hurry still at least from SLR. I looked and see that the average land is roughly 100 feet above sea level in Florida. Despite all the Cassandra-ism around here, short of a giant meteor hitting the earth, nuclear attack, etc., you should profit nicely if trends change and you act in a reasonable timeframe. Sold. Back to Panama in two days. No more worries of sea level rise, hurricanes, and Florida's history of boom and bust real estate. Would have been hard to do that in the stock market. Newfie wrote: Very familiar with wind driven tides. Typically in shallow waters with some decent fetch. From what I make out this is persistent, not wind driven. I’m gonna try to keep an eye on it and see if I can make some sense of it. I’ve no good explanation so far. El Nino/La Nina is more than anything else a long term wind cycle. When the winds blowing east to west over the broad pacific get really going and hold 20 or 30 months the water level on beaches in Indonesia and eastern Australia can be as much as 2 meters above mean sea level. When the winds die down and all that piled up water flows back eastward the drop can be quite visually obvious. I suspect what you are observing is something similar. The jet stream frequently 'stalls' in the sense that the Rosby waves cease their migration from west to east thus creating a persistent air flow pattern that lasts weeks rather than days. Couple this with the storm surge from the recent hurricane and the surge simply has not relaxed all the way back down to mean sea level yet. Once the current Rosby wave migrates on the water will return to its prior average levels. Alternatively about a decade ago now the great east coast current split with a branch continuing up the west side of Greenland where before the water had flowed south on that side. this resulted in water 'piling up' in harbors all along the west coast of Greenland as the two currents collided and reached a 'new normal' Is it possible something similar is taking place around Grenada? We’ll ive been watching the tide here in Grenada and talking to a few folks. Consensus is that there was a period or two of very heavy rain and since then the tides have been higher than normal, about a foot. Talking to the folks who work here is worthless other than to understand how little folks know. So one guy explained how the tides are higher because the sand filled in and the water is shallower so the tide adjusted to stay above the sand. OK then. I’m still have no idea what’s going on, none of the explanations I’ve heard make any sense. The barometric pressure is constant, there is little wind, the rain makes no sense as the yard is flat and only a couple of feet above sea level so any rain will just run off, the bay is open to the ocean. 12 01 22N. 61 40 45W if anyone is interested. ...... After years of hearings, a trial date had been set for October 29. But 10 days before trial, the US Supreme Court issued a stay that has temporarily halted proceedings. The court is considering the federal government's petition for writ of mandamus, which the Department of Justice describes as an "extraordinary remedy" that should be used in "exceptional circumstances of peculiar emergency or public importance." Federal attorneys are questioning whether the kids have a right to "a climate system capable of sustaining human life" under the Constitution or public trust doctrine. They say federal authorities will waste time and money by responding to what they call "baseless claims." And they argue in court filings it's a violation of the separation of powers to ask courts essentially to impose climate-change policy on federal officials, rather than waiting for Congress or other elected officials to do that. Hardly a baseless suit IMHO. Life, liberty, and the pursuit of happiness. Seems to hit all three. “Promote general welfare” seems to open the topic for discussion right there. It does not surprise me that they didn’t have a clause that says explicitly “Tho shall not spoil the air, waters or land shared by the people’s.” They probably thought no one would be that stupid. Kind of like saying “Tho shall not inject the masses with opioids.” But, hey, they were wrong, we are that stupid. Right on. Too bad there are so many that believe that profit outweighs the general welfare. This is nothing new. See the Highland Clearances for a great example. Yes Cid, we are a crule and heartless species. A team of more than 100 scientists has assessed the impact of global warming on thousands of tree species across the Amazon to discover the winners and losers from 30 years of climate change. Their analysis found the effects of climate change are altering the rainforest's composition of tree species but not quickly enough to keep up with the changing environment. In particular, the study found the most moisture-loving tree species are dying more frequently than other species and those suited to drier climates were unable to replace them. ... The species most vulnerable to droughts are doubly at risk, as they are typically the ones restricted to fewer locations in the heart of the Amazon, which make them more likely to be extinct if this process continues. The study, published Oct. 19 in the journal Nature Communications, sought to provide a more complete snapshot of disturbances in the world's temperate forests by quantifying the size, shape and prevalence of disturbances and understanding their drivers. The study found that while many temperate forests are dominated by small-scale disturbance events -- driven largely by windstorms and cooler, wetter conditions -- there was also a strong link between high disturbance activity and warmer and drier-than-average climate conditions. Andrés Holz, a co-author and geography professor in PSU's College of Liberal Arts and Sciences, said this suggests that with a warming climate, disturbances are expected to become larger and more severe in some temperate forests including the western U.S.
"Under the warmer conditions we have been seeing, it is likely that we're going to see a higher probability of areas that tend to have very big disturbances," he said. Climate change may be occurring even faster than first thought. That is according to a ground-breaking new study by Dr Clayton Magill from the Lyell Centre at Heriot-Watt University. Scientists measured the vast migration of sea bed materials such as clay and sand, a process that occurs over thousands of years. The research found that constant movement resulted in the erosion of ancient fossils trapped within the ocean floor and that these fossils release their harmful carbon dioxide, which is a strong greenhouse gas. Researchers previously thought that the rate of erosion on these fossils was significantly slower – hence climate change was slower. Our results suggest differential lateral transfer dynamics can influence apparent lead–lag patterns among proxies with differing grain-size associations. Ocean dynamics served an important role during past dramatic climate changes via impacts on deep-ocean carbon storage. Such changes are recorded in sedimentary proxies of hydrographic change on continental margins, which lie at the ocean–atmosphere–earth interface. However, interpretations of these records are challenging, given complex interplays among processes delivering particulate material to and from ocean margins. Here we report radiocarbon (14C) signatures measured for organic carbon in differing grain-size sediment fractions and foraminifera in a sediment core retrieved from the southwest Iberian margin, spanning the last ~25,000 yr. Variable differences of 0–5000 yr in radiocarbon age are apparent between organic carbon in differing grain-sizes and foraminifera of the same sediment layer. The magnitude of 14C differences co-varies with key paleoceanographic indices (e.g., proximal bottom-current density gradients), which we interpret as evidence of Atlantic–Mediterranean seawater exchange influencing grain-size specific carbon accumulation and translocation. These findings underscore an important link between regional hydrodynamics and interpretations of down-core sedimentary proxies. If the void continues to expand, there is a fair chance the Thwaites Glacier will begin to collapse into the void, triggering rapid ice retreat back up into the West Antarctic Ice Sheet along with significantly more sea level rise then IPCC has been predicting. There’s always a Thwaites glacier study going on, melting faster or melting slower, take your pick. There is nothing we can do about it, except observe a natural process that has been going on for millions of years. Doomers will need a really big bag of popcorn, even the accelerated melt scenario’s are 100+ years. Thwaites Glacier and the surrounding coastal region alone could raise sea levels by half a meter (1.6 feet) within 100 years. A new NASA study finds that Thwaites' ice loss will continue, but not quite as rapidly as previous studies have estimated. The new study, published in the journal Geophysical Research Letters, finds that numerical models used in previous studies have overestimated how rapidly ocean water is able to melt the glacier from below, leading them to overestimate the glacier's total ice loss over the next 50 years by about 7 percent.The glacier has the potential to add several inches to global sea levels. What people are failing to grasp is water terminating glaciers are only stable when they are resting on submerged land. When they pull back from the ridge/sill that keeps them stable they begin shedding icebergs at a greatly accelerated rate, limited mostly by how quickly the new bergs can float away from the new face and let the warmer sea water reach and erode it further. Sure, its not like firing a rocket, but you only have to look at what is taking place in Alaska and Greenland where water terminating glaciers are in rapid ret5reat to understand what is on the cusp of happening in Antarctica as well. Thwaites and Pine Island glaciers are both stable on sills ATM, but once they retreat off of them it is literally scores of miles of very deep basin filled with ice behind the sill. Ice is mechanically weak in air, at a height of about 250-300 feet above sea level it becomes unstable and sheers off into bergs. Sitting on the sill stabilizes the base, take away that stability and the dynamics change, radically and rapidly. What? Are you telling me that otherwise ethical scientists would phrase the results of their research in the most flamboyant terms in hopes of securing continued funding for next years expedition complete with a couple of nubile young grad students? jawagord wrote: Thwaites glacier study ..... observe a natural process that has been going on for millions of years. 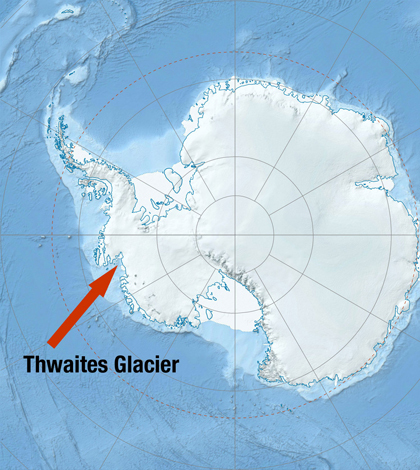 Actually, the huge cavity just studied under the Thwaites Glacier using submersibles is thought to have mostly formed within the last three years as warm ocean water begins to penetrate under the Thwaites Glacier. The basic concept involved here is that the warm ocean water is rapidly melting the base of the glacier. If it took "millions of years" to form, then I wouldn't have posted about it here in this topic about "Abrupt Climate Change." Finding a possible “hole” under the ice is not abrupt climate change, it’s a natural process that’s been occurring for millions of years to glacial ice that is in contact with sea water. We only recently have the technology to observe it or in this case infer it from plane and sat radar, which makes it an interesting discovery for the scientists and another scare story for the NYT. Climate Change could proceed in a number of 'shocks', i.e. really big changes all at once. It will be a sight to behold what the reaction is to these events. Geologic Gradualism has been giving way to geologic catastrophism. I'm just speculating, of course.